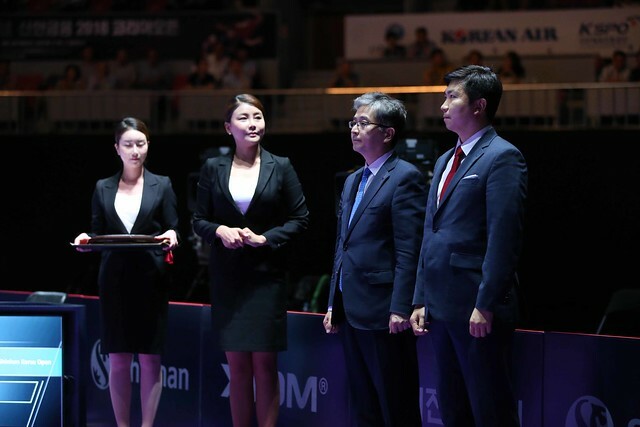 A new pairing will be added to this year’s roll of honour; that fact is certain in the Mixed Doubles event at the forthcoming Seamaster 2018 ITTF World Tour Platinum Shinhan Korea Open. Preceded by a two day qualification tournament, play commences in Daejeon on Thursday 19th July. The name of Chen Xingtong, who recently won in Japan in harness with Liang Jingkun, does not appear on the entry list but that of compatriot, Lin Gaoyuan, her successful partner on home soil in China, does appear. He partners Wang Manyu; they are the no.6 seeds but are they not the title favourites? Lin Gaoyuan may have experienced trials and tribulations last year but left handed, a player with exquisite feeling for a table tennis ball, combined with an electric forehand; surely there must be a queue of right handed women wishing to be his partner! Add to the equation that Wang Manyu is very much a perfectionist and by the day ever more consistent; Lin Gaoyuan may well collect his second ITTF World Tour Mixed Doubles title of the year. A new partnership but note the pairs listed above; all played in either China or Japan or both; their eyes are very much directed towards the Tokyo 2020 Olympic Games. Masataka Morizono and Mima Ito, the reigning Japanese national champions and top seeds, were the runners up in China; next in line Hong Kong’s Wong Chun Ting and Doo Hoi Kem, who competed in both China and Japan, must be hoping for a more sympathetic draw. On both occasions they departed proceedings at the quarter-final stage, on both occasions losing to the eventual winners! Similarly, Korea’s Lee Sangsu and Jeon Jihee, semi-finalists in China when losing to Lin Gaoyuan and Cheng Xingtong, occupy the no.3 seeded position; one place ahead of Hong Kong’s Ho Kwan Kit and Lee Ho Ching. In China they experienced an opening round defeat at the hands of Zhang Jike and colleague, Wang Manyu; in Japan they reached the semi-finals losing to Liang Jingkun and Chen Xingtong. Notably amongst the seeds, the only untried partnership on the international scene other than that of Lin Gaoyuan and Wang Manyu, is that Japan’s Tomokazu Harimoto and Hina Hayata, the no.7 seeds. Notably, the no.8 seeds, the host nation’s Lim Jonghoon and Yang Haeun reached the penultimate round in China, losing to Masataka Morizono and Mima Ito. The Tokyo 2020 Olympic Games very much on the mind; so is the more pressing Buenos Aires 2018 Youth Olympic Games, the Chinese representatives join forces in Daejeon; not seeded Wang Chuqin partners Sun Yingsha.